Catalans live today in one of Spain’s autonomous regions, where their language is official and recognized by the government. Catalonia also extends to the Balearic Islands and other islands off the Iberian Peninsula. 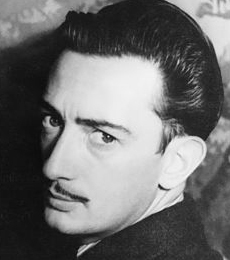 The surrealist painter Salvador Dali was born in Catalonia. Columbus was possibly a Catalan Jew. The Iberian Peninsula – Catalan population data represent DNA samples from 50 individuals who had all four grandparents born in in the the Kingdom of Spain’s Girona province [Province of Girona] in the Catalonia region (Catalonia). Samples were obtained by the Faculty of Health and Life Sciences, in the Dept. of Molecular Biology and Evolution, at Spain’s Pompeu Fabra University in Barcelona/Catalonia. Photo: A young Salvador Dali, by Carl Van Vechten, 1939. Library of Congress. The Spanish – Balearic Islands population data represent DNA samples from 113 unrelated individuals on the Balearic Islands (Balearic Islands) in the Mediterranean Sea, which mark the easternmost part of the Kingdom of Spain, the nation’s official title (U.S. Relations With Spain and Spain). Samples were obtained by the Genetics Laboratory of the Biology Dept and the Faculty of Sciences. at the University of the Balearic Islands; as well as the Pathological Institute of Molecular Immunity at the University of Porto in Portugal; and the Institute of Legal Medicine in the Faculty of Medicine at the University of Santiago de Compostela in Galicia, Spain. Source publication: Allele Frequencies of 13 Short Tandem Repeats in Population Samples From the Iberian Peninsula and Northern Africa, Perez-Lezaun et al., IJLM, 2000, 113, p208-214. – STR Data For The AmpFlSTR Profiler Plus Loci From Majorcan, Minorcan And Valencian Populations (Eastern Spain), FSI, 2001, p201-204. Genetic Variability at Nine STR Loci in the Chueta (Majorcan Jews) and the Balearic Populations Investigated by a Single Multiplex Reaction, IJLM, 2000, p263-267.